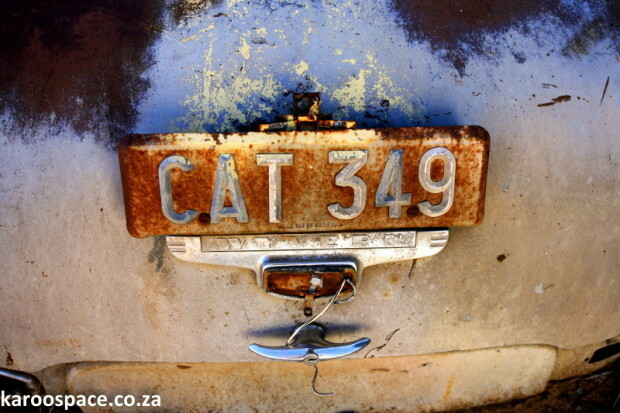 The old, fondly remembered Cradock number plates started with CAT. 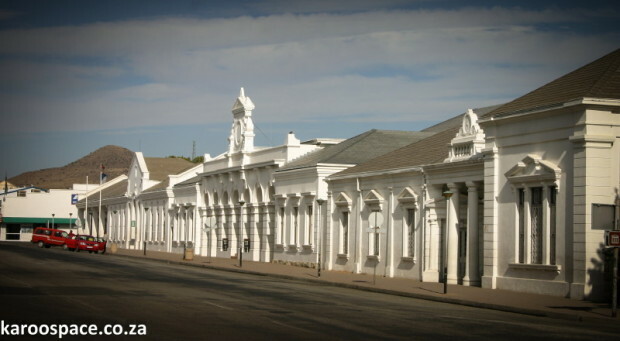 Ouma Hattingh was born in Cradock in the nineteenth century, in a different time. 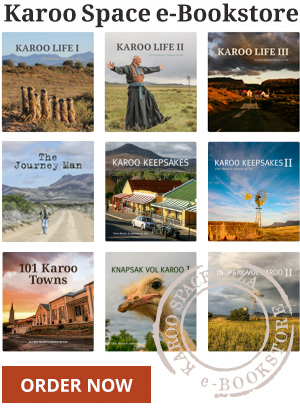 Oupa came from Tarkastad, where his forefathers had trekked from the Cape of Good Hope. They were married early in the twentieth century and set up house in Cradock’s Cawood Street. Setting up house was a serious business in those days. There were no supermarkets around the corner with frozen chickens and such conveniences. No, you had to slaughter the livestock, gut them and skin them yourself. So it was that young Miena Visagie joined the household, beginning a liaison that would outlive Oupa and nearly outlive Ouma. When it came to cooking Ouma was a past master. She used to make pancakes on a primus stove, She would sprinkle them with sugar and cinnamon and get the sugar to melt. The koeksisters were plaited, fried and dropped into icy syrup. And koeksisters! What a treat! I used to watch her plait the dough into the traditional shape. This would then be plonked into a four-gallon paraffin tin, full of oil, on the primus stove. Next to the primus stood another four-gallon paraffin tin with ice cold syrup made from sugar and water. 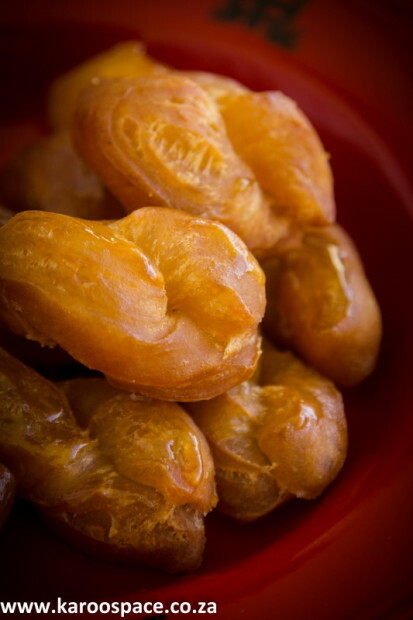 Once the koeksisters were cooked, they were immediately plopped into the syrup and left there till the syrup had permeated the whole koeksister. While this cooking was going on, dear Miena was washing dishes as though her life depended on it. Hot water had to be boiled for this because there were no electric geysers. I remember sitting at the eight-seater table that held pride of place in the kitchen while Ouma cooked and Miena cleaned. On cold mornings I was given the warm tea cosy to put my cold hands in after the tea was poured. A tin of samp was mine to make patterns with on the table while I watched. Occasionally Ouma would cut some of the fat off the mutton and fry it to a crisp into ‘kaaings’, delicious bits of crispy fat. The mutton fat from a roast leg would be collected and put in the fridge. Used with salt and pepper in place of butter on fresh bread, it made a most delicious treat. Sunday lunches were something else. I always wondered where the army was that Ouma was going to feed but she steadfastly maintained that you never know when visitors might arrive and they must be fed. There were no such things as starters or even wine. The main fare was usually a leg of lamb and a fowl – the size of which makes today’s supermarket fare look like day-old chickens. Then came the ‘bykos’ which consisted of rice, roast potatoes, boere beans, cabbage, pumpkin, squash, a beetroot salad, a carrot salad and my favourite, peaches and dumplings. These were boiled dried peaches on top of which dumplings were served. With lamb and potatoes this was an absolute delight of mine. Then there was dessert. Ideal milk, canned peaches, canned pears, blancmange or jelly, and on special days my favourite, ‘nasionale’ pudding. I cannot quite remember the ingredients but there were raisins and apricot jam, a chewy crust and lots of lovely sauce. Ray Hattingh now lives in the Cape, and is director of the South African Association of Retired Persons.